I met up with Hayden Knight Weiler to interview him about his new video “I Love Italy” which has become a YouTube sensation, (with over 13K views in the first week). After knowing him only as a colleague and acquaintance, after our conversation today, that all changed. It was about a year ago when I was in a restaurant and overheard an American guy speaking English to his friends at the table next to us. The conversation swayed between English and Italian and I realized he wasn’t a tourist but probably living nearby. Unlike Milan, where it is easy to find lots of expat Americans, in Lecco, there are very few of us. After the meal, I timidly introduced myself and that’s when I met Hayden Knight Weiler and his wife Elena for the first time.After meeting that day, we exchanged a few messages about teaching jobs, holiday pleasantries and every once in a while I would run into him in the city center, but that was the extent of our friendship – until today. So what changed? We met for coffee and talked, really talked. It was a good conversation. We talked about living in Italy, our mutual love for Lecco our adopted home, and things we miss about America. I found a kinship with Hayden. He’s a gentle soul wearing the same proverbial rose-colored glasses and can actually see what I see! Our conversation covered everything from pancakes to pizzocheri, to spirituality and life in general. Although we have a lot in common, his journey to Italy is very different from my story. Hayden grew up in Lyle, Oregon, a small town 121 km (75 mi) east of Portland. He had a happy life growing up with two encouraging and spiritually rooted parents. He says, “My parents are awesome, they’re -they’re just awesome! They gave us such and incredible childhood.” Hayden’s parents taught him and his sister the values of the Bahá’í Faith, a religion based on the oneness of humanity. After traveling in South America and teaching children in a Bahá’í community in Ecuador he went back to Oregon. He attended the University of Bellingham in Washington majoring in International Studies and Spanish. After another stint in South America, he returned to the states. A visit to his sister, who was living in New York at the time, would change the course of his life. We joked about how the Lecchese are always asking us “Why do you live here?” and wholeheartedly agreed that we live in the most beautiful place in the world. Music has always been a part of his life. His father Bill, always encouraged musical creativity. “My Dad is an amazing musician. He wrote songs for all of us kids. He writes funny songs, deep songs, he is really like my musical inspiration.” Hayden’s true passion is songwriting, and “I love Italy” was something that came to him quite easily. Sang in both languages, Elena helped him with the Italian grammar and their baby Liam also stars in the video. The music video is the evolution of that day and the response has been nothing but positive. The song and video were filmed here in Lecco. Stefano Fumagalli of HD Studios directed the studio recording and Filippo Pascuzzi directed and filmed the video. To keep the budget low, the video was filmed in 13 hours of rushing from location to location to get the job done. 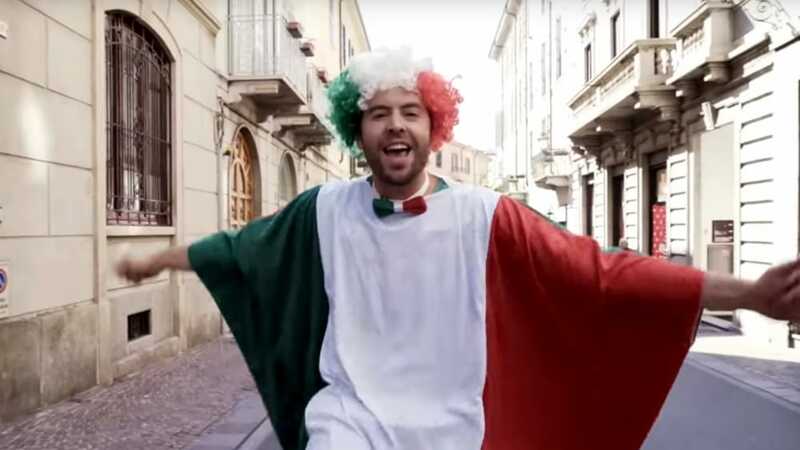 Scenes of Malgrate, Lecco center, the San Nioclò bell tower, and local businesses Levi Moda Uomo, Pizzeria del Corso, Flylibell Parapendio, Bar Laga as well as his actual students are featured in the video. I’m certainly looking forward to what he has in store next!